The Cattier family has been growing grapes in the Champagne region of France since 1763, and this autumn they are celebrating their latest coup de grâce: Armand de Brignac. Inside Champagne Cattier's cellars beneath Chigny-les-Roses. There’s a certain type of person who can recall what the weather was like in two specific months of the year more than two decades ago. Someone whose livelihood could be devastated by an uncharacteristically cold July or a wet September; a person who cares about soil quality and tasting notes in equal measure. “If I remember correctly,” says Alexandre Cattier, inhaling deeply from a glass, “it was a good year — quite warm and cloudy during July and August.” He’s holding a pour of 1995 Cuvée Renaissance Cattier Premier Cru, which benefitted greatly from those temperate conditions, resulting in a balanced and toasty drop. The aforementioned wine expert must have at least a small amount of champagne in his blood, given that he’s the 13th generation Cattier to run the business along with his father, Jean-Jacques. The family has been growing grapes in Montagne de Reims, a rather scenic range of hills in the Champagne region, since 1763, and have been producing their own bottles under the Cattier name since 1918. The champagne house’s headquarters are situated in Chigny-les-Roses, just a short, rolling drive away from those vineyards, and is precisely how you’d imagine a small village filled with wine-making houses to be: it’s comprised of dusty-coloured buildings with old-fashioned signs hanging outside, and it’s not hard to spot a stray cork lost down a drain or lodged stubbornly in a crack. I’m visiting this postcard location not necessarily to talk about the French house’s storied heritage — rather, the comparatively new addition to its portfolio of exceptional drops: Armand de Brignac. The title came about in the 1950s, when Alexandre’s grandmother took a liking to a character’s name in a book, and registered it for the creation of a potential new wine. But it wasn’t until the turn of the century, when the family decided they wanted to create a new prestige cuvée, that it was finally put to use in tribute to the family matriarch. After the fruit is harvested in September, it’s taken to the house’s headquarters and put into a coquard press, which is known as the Rolls-Royce of presses in Champagne and operates slowly to effectively extract the juice. The first portion that comes out is the cuvée, which is the finest part of the juice, and which is used in Armand de Brignac. After fermenting, it’s either bottled as a single vintage or an assemblage of different vintages — as is the case with Armand de Brignac’s famous Gold Brut. 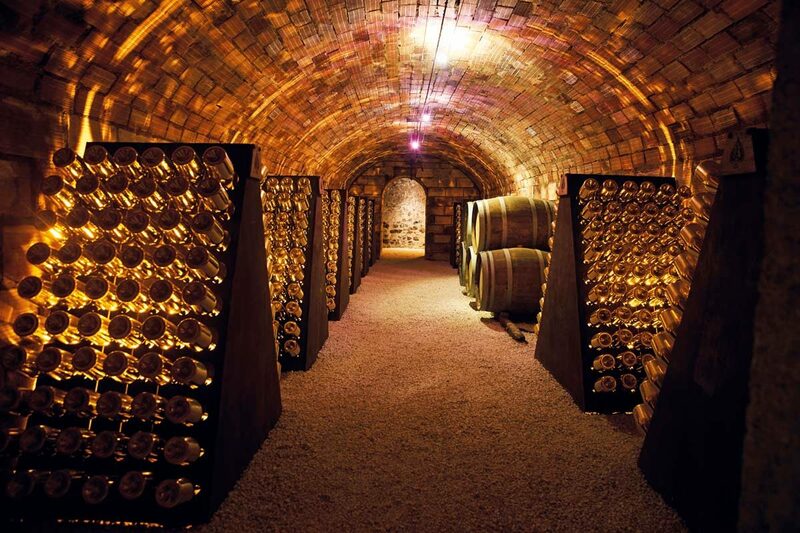 These bottles are then laid to rest underneath Chigny-les-Roses, in the Champagne house’s grand cellars, which snake for kilometres at 30 metres deep. Taking the 119 steps to the bottom, one can see that the walls are filled with character — chalky remnants can be spied among the bricks, as evidence of the geological make-up of the region, said to give the sparkling wine its fine flavour. The walls tell other stories, too: built more than 150 years ago, these cellars boast gothic and renaissance architecture; they once housed people hunkering down during World War II; and were checked for nuclear safety throughout the Cold War. 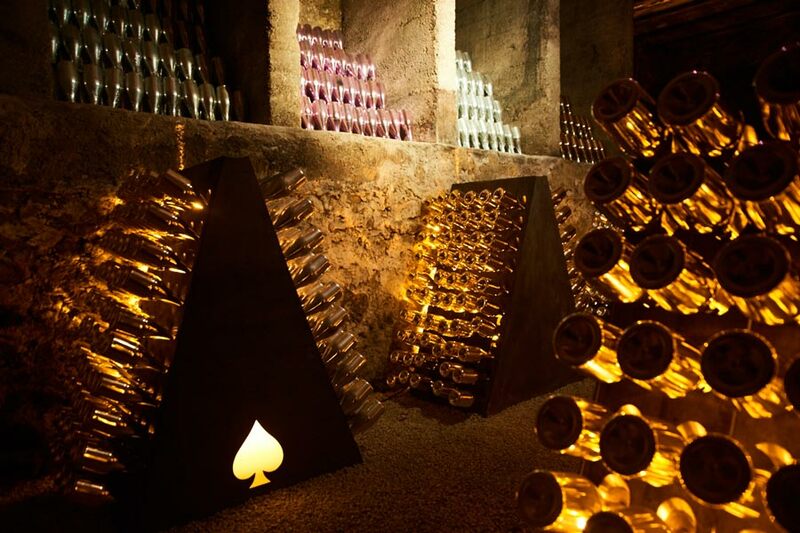 But perhaps the most magnificent sight is the glinting bottles of Armand de Brignac, aged on their lees, reflecting on to their surroundings, in a spectacular rainbow of gold, silver and pink. This is where they’ll remain for five to eight years, before a process called the disgorgement of the sediment — when the collected lees at the neck of the bottle are frozen and shot out, leaving only clear wine behind. A dosage, or liqueur d’expédition, is used to top up the bottle, the sugar content of which is dependent on how sweet the finished result will be: Armand de Brignac’s Blanc de Noirs has five grams of residual sugar per litre, while its Demi Sec has between 33 and 50g/l. Finally, the bottles are corked, finished, and ready to be sold. The fruits of the Cattier family’s labour have not gone unrewarded, and the Armand de Brignac range has been met with widespread critical acclaim since it was first released to market. But while the contents are impressive, it’s the bottle itself that’s put this champagne on the viticulture and pop culture map. After falling out with Cristal, the rapper Jay-Z was in search of a new bubbles brand with which to be affiliated, and is said to have been drawn to the ostentatious aesthetic of Armand de Brignac on spying it in New York. It featured in the artist’s video for 'Show Me What You Got' in 2006, referencing the metallic gold bottle and the ace of spades logo, which the brand has come to be nicknamed outside of France. Jay-Z has since taken such a liking to it that he bought the company, boosting its profile further among fellow celebrities and their devoted followers. One particular anecdote stands out: the gambler and businessman Don Johnson once spent £120,000 on an Armand de Brignac Gold Brut Midas — the equivalent of 40 regular-size bottles — at London’s One for One nightclub, breaking the record for the most amount spent on a single bottle of champagne. But no matter how popular Armand de Brignac becomes, this is a boutique brand at heart. From picking the grapes to pressing the fruit and hand-applying the pewter labels, there are only 18 artisans who touch each bottle and its contents — a testament to how small this house’s run is. Each year the company produces a little more than 100,000 bottles, which pales in comparison to the 5-10 million some of the bigger champagne houses sell per annum. If grapes from a certain year aren’t up to scratch, Armand de Brignac also has the freedom not to produce wine. “We would rather not produce anything than have an average production,” Alexandre says. Which, despite the company’s popularity and potential for growth, seems like a fairly noble and artisanal attitude to carry.